Home Office Paperwork - Home Organize It! AHHHH! Does this stack of papers look familiar? Does it look like your home office paperwork? If so, it's time to get organized. Paperwork can be quickly organized with a simple Keep/Toss Method and an Easy Filing System based on your personal retrieval needs. Everyone knows that paperwork should be kept organized, but the problem usually is it's a boring task and it's hard to prioritized when time is so limited. So where do you find the time? Therein lies the rub... you need to organize your paperwork to save timetime to to organize your paperwork! What to do? Start with the small things. And gradually add bigger "projects". 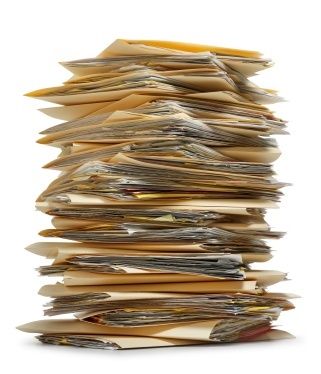 Fact: You will only get your paperwork more organized by taking the time to organize it! Well, if you are ready to commit to doing this process, if you really make an effort to follow these techniques, you will very quickly get your home office paperwork organized. And with a little practice and discipline you will be able to keep your paperwork reasonably organized.Ready? Let's go! The first thing to do is to take a moment and think about retrieval. Consider the paper that comes into your home office and how often you need to retrieve or refer to it. We are just "considering" at this point. And the point is... you really only retrieve about 20%! So why spend your valuable time stacking, handling, sorting or filing 100% of your papers? If you spend one hour every month filing everything, then you may be wasting 48 minutes every month! And that's just on paper... just think of the time-saving possibilities! Try to keep that foremost in mind as we work through your home office paperwork. It will help to reduce the amount of papers that come into your home office in the future. The important thing here is to "keep it simple". 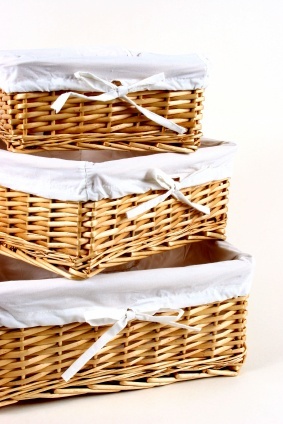 First, collect three boxes or baskets (any type will do). That's it! You're all ready to get started! Now, decide on an amount of time for your first session of home office paperwork organizing... 20 minutes, 30 minutes, an hour. Two hours is really about as long as anyone can productively pre-sort through paperwork. After all, we have other important things to attend to, right? Choose a starting point and move around the office in a clockwise direction. Set a timer or an alarm for the amount of time you decided on and pick up a pile. Stop when your time is up and schedule another home office paperwork organizing session on your calendar or planner as soon as possible. You do not want to lose your momentum. Pre-Sort all all of the Home Office Paperwork that you have been piling or neglecting. Remember, just the three boxes/baskets. Don't get side-tracked on wanting to file or put something in another room. If you do come across something that needs to be attended to right away so please please make yourself wait until your session is up. Set the timer or alarm and go! Toss Box: Bag it, recycle it, just get it out of your home office now! Whew, what was all that stuff anyway??? Use what makes sense to you based on what you pre-sorted into the box and then pre-sort again. But really try to keep it to three categories. Keep Box: The Challenge? Not really, just remember to only keep what is really important. We will Pre-sort your Home Office Paperwork again based on the potential frequency that you may need to retrieve a paper. Will Retrieve (documents, tax items, mortgage statements) See "Papers To Keep" for a guideline. Might Retrieve (phone bills, insurance invoices). Won't Likely Retrieve (but WANT to keep). All of your home office paperwork will fall into one of these categories. Can't decide? Perfect for "Might Retrieve"! Now....you need to make a few decisions based on your personal preferences. Your time is valuable, right? You really don't want to spend much more of it on all this home office paperwork do you? I recommend that you DO file your "Will Retrieve" Box. But we will even simplify this filing. For the "Might Retrieve" and "Wont Likely Retrieve" boxes, why file? Again, you need to decide based on what you like. But if you "Might" need it again or "Won't Likely" need it again, why spend any more time on it? You may need to spend a few minutes here and there retrieving something from these boxes. But certainly not the hours you would spend setting up detailed files, filing and keeping up with them. So for these two categories, I say Pile, Don't File! It's Revolutionary! Liberating! Practical! Remember to review Papers To Keep for a general idea of what and how long to retain these papers. The way YOU set up or modify your filing system for retrievable items will vary considerably from anyone else's. I have researched many filing systems and have narrowed the multitudes down to the best of the best. There really are only a handful of simple but effective filing systems. Organize all your "Will Retrieve" papers into one place with the EasyFile Home Filing System. It's just what it claims to be... EASY and it uses a Straight-Line Filing System which offers many advantages, such as allowing you to add or remove any file without disrupting your pattern. It's user-friendly, easy on the eye (personally I love the symmetric look), and convenient to work with. I use this system myself as well as with my offline clients and it works seamlessly with the Keep/Toss Method described above. Another great option for Home Filing is the Get Organized Now! Easy Organizer. The Easy Organizer gets all your information into one place. With this system, you file into a binder that is divided into categories. You choose your categories based on what papers you decide to keep. To organize essential documents such as birth and marriage certificates, financial records, insurance policies, etc., I recommend that you set up a tracking system so you can quickly and effectively organizs all your "keeper" documents into one place. You know, all those documents that you or your family will need at some point but that many of us procrastinate finding and protecting. Bottom line, find yourself a filing and tracking system that works for you and get them up and running today. The quicker you tackle these, the easier it will be to stay relatively caught up. Whatever systems you choose, remember that your goal should be to spend as little time as possible keeping them up. Make them efficient and they will be effective for you. Take the "File" Box and file using your smart new system. Mark the "Pile" Box with the approximate dates the papers cover and store on a shelf near the File System. Finally, visit the "Won't Likely Retrieve" Box and sort once more. Ask yourself if you REALLY need to keep each paper with the goal being to reduce even further. Put what's left in the box, mark it with the year and store it next to your "Might Retrieve" Box. You, my friend, are Realistically Paper Organized! What a great feeling! Now let's not ever get so behind again! Remember to schedule a block of time...20 or 30 Minutes as often as is needed to Keep Up with the Paper Enemy. The rest of your Home Office Organizing will be much more fun! Go From Home Office Paperwork To Home Organize It!